Looking for dependable roofing contractors in the Allen, Texas area? Since 1923, we’ve been delivering top notch service to all of our customers and would love to help you with your needs. Give us a call today to learn more about how we can help! It’s not something many homeowners do very often, but it’s easy to see why. With so many other things going on in our daily lives, including worrying about things inside a home, like renovations, or repairs, thinking about the condition of your roof tends to drop off the list pretty quickly. After all, the roof just “sits there.” It doesn’t really do much other than provide coverage to your home, so for many people, it only becomes a problem once they see a leak in the ceiling and realize that water must be coming in from a hole in the roof somewhere. But here’s the thing. 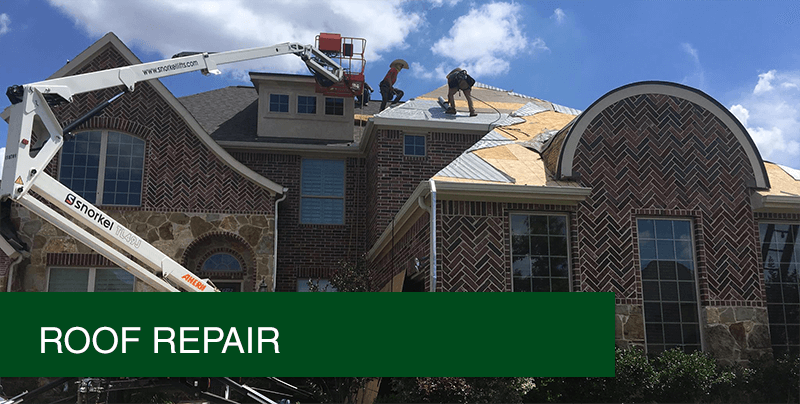 Roofing maintenance and repair don’t have to get to the point where you’re seeing a problem before you can benefit from some work. A roofing expert can help, and here’s how. Anyone that’s lived in Allen, TX for quite some time knows that we don’t always play host to the kindest, gentlest weather in the USA. Storms can be unforgiving in this part of the country, and hail can definitely take its toll on a home not adequately prepared against it. Severe storms can put stress and abuse on a roof that it may no longer be prepared to endure. Gale force winds can tear off shingles. Hail, if it comes, can be especially devastating not just to a roof, but anything that is outdoors when the hail stones fall. If the size and speed of the hail is large enough, the damage can be significant. Then there’s the slow kind of damage that’s even easier to miss, because this is all about erosion, weathering and time. There may be small flaws or weaknesses in your roof that aren’t even a big issue. But, given a long enough timeline, the passing of seasons, and the expansion and contraction of water turned to ice, melting back to water, damage can slowly accumulate. Once it’s accumulated enough, that damage can accelerate. Lowry Roofing Co. are the experts in roofing repair, replacement and installation. We stand by our name, and our experienced team is ready to help you with the repairs you suddenly realize you need after a bad storm. Or we can do the inspection and maintenance you want if you think your roof is okay, but you’re not sure. We can even help you if you’re thinking of selling your home and want to ensure that you get the best price for it by adding some value with the installation of a new roof. Whatever needs you have, we know exactly what to do professionally to get the job done, and we can help you financially with any insurance questions or concerns you may have about your roof. We stand by our Christian values and treat each of our customers with care. If you have a roof that needs replaced or repaired, we encourage you to reach out to us as soon as possible. Call us at (469) 412-4364, or reach out to us at our website or through e-mail to find out more.